Infinity Silver Owl Leather Bracelet Only $2.14 PLUS FREE Shipping! You are here: Home / Great Deals / Amazon Deals / Infinity Silver Owl Leather Bracelet Only $2.14 PLUS FREE Shipping! The latest trend of leather bracelets just gets better and better! 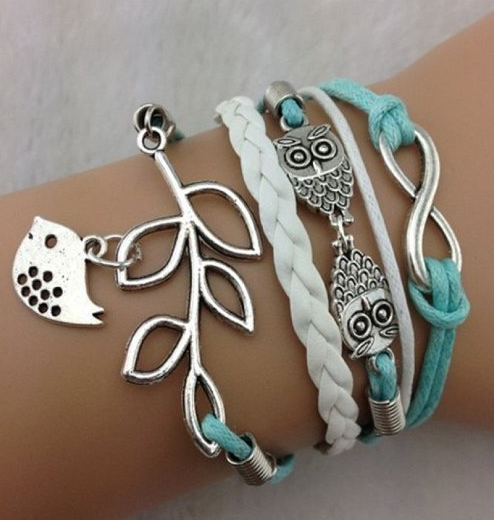 This cute Infinity Silver Owl Leather Bracelet is Only $2.14 PLUS FREE Shipping! It features an infinity symbol, own, bird and leaf charm on separate looking bands. Get yours NOW!